With more than 25 bones in our feet, it’s no wonder why so many people develop problems with their plantar fascia, the ligament that connects your toes to your heel and supports your foots natural arch. The plantar fascia can often become inflamed, torn, weak and swollen, leading to problems not just in your foot, but your entire body. 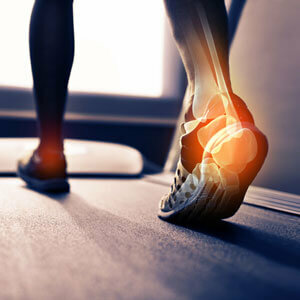 Treating plantar fasciitis is about more than just treating the area that hurts. With specific chiropractic adjustments, Dr. Prinkey focuses on the low back, knee and hips to improve weight bearing and joint function. Discovering the root cause of the problem is key in relieving plantar fasciitis. In addition to chiropractic care, Dr. Prinkey may recommend custom orthotics to help support the bones and joints in your feet to help reduce future inflammation of the plantar fascia. For your convenience, these orthotics can be ordered at our practice. If you’re dealing with foot and heal pain, you deserve relief. Contact our practice today to schedule your first visit.